A Near Fine condition book. Clean, bright and tight with no foxing or previous owner marks. The striking Me262 dustjacket by Michael Turner is in Fine condition, complete and unclipped. It looks stunning. 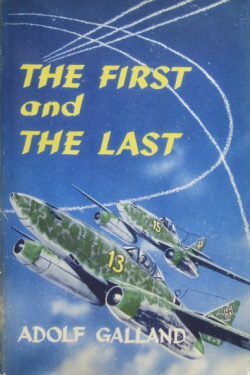 This is the autobiography of Adolf Galland, an outstanding fighter leader who was torn from the cockpit to defend his country – and sometimes his own pilots – in the bizarre bureaucracy of the Luftwaffe High Command. The most famous German ace and fighter leader of his generation, Galland’s story is simultaneously that of the Luftwaffe Fighter Arm, in which he served from foundation to finish. 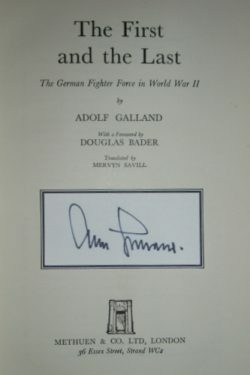 Galland’s combat career began in the Spanish Civil War and continued from the Polish campaign of 1939 right through to the defeat of Germany in 1945, when he was flying Messerschmitt 262 jet fighters. 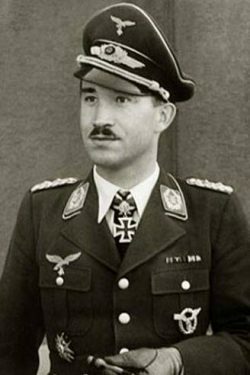 From the outbreak of hostilities Galland rose quickly in rank and influence, becoming chief of Luftwaffe fighters, a position he lost as a result of difference with Hitler. He then returned to front line flying. Because of his high ranking and command positions he was the ideal person to assess Germany’s WWII fighter force policies and strategies and, in addition to this, he also comments on other prominent German political and military figures. A classic aviation autobiography and still a great book on the Luftwaffe written by an expert who was actually there. A lovely condition copy with a neat signature.